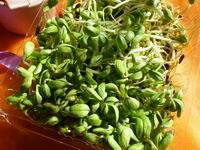 Many bean sprout recipes here: stir fry recipes, salad recipes, bean sprout noodle recipe, mung bean sprout recipes, soy bean sprout recipes and black bean sprout recipes, etc. You can cook many healthy and delicious bean sprout dishes. Most of the time it is treated as a side ingredient. You can add it in a stir fry dish, add it in a soup or in a salad, or even in a pancake. If you don't like the bean smell, add some rice wine or red wine before or when cooking. Add some vinegar to protect vitamin C from spoiled. Bean sprout has ascending Qi, so it's a good food in spring. It's not the right time to eat in autumn and winter. Sprout always comes together with vermicelli. In summer Mung Bean Sprout with Vermicelli and Cucumber is a very popular dish in China. It helps us cool down. Chinese leek and soybean/black bean sprout are also a good combination. They help to promote Yang Qi.